Russia’s Nashi (Ours in Russian) youth movement, which made a name for itself by organizing outrageous political acts, is set for a complete overhaul. Russian media reports that it will be replaced by a new youth organization with a new name and different objectives. Vedemosti learned about Nashi’s planned “re-start” from two Kremlin officials. The primary goal of the new movement will now be the social adaptation of the youth. Earlier, Izvestiahad reported that the organization will no longer take part in political actions and public rallies. Yet it is precisely for its involvement in mass political actions that the Nashi movement had gained notoriety since its formation in 2005; its rallies attracted up to 100,000 participants over the course of nearly a decade. Russian media notes that the movement, which was set up with the backing of the presidential administration, had been called upon to tackle the threat posed by the so-called Orange Revolution in Russia. 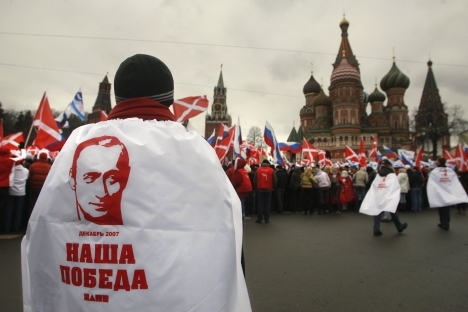 One of the Nashi movement’s biggest events was the pro-Putin rally held on Manezhnaya Square on March 5, 2012 — the day after the presidential elections. Many of the Nashi movement’s actions have been deliberately scandalous in nature. In 2007, activists held protests in front of the British Embassy in Moscow, accusing then-Ambassador Anthony Brenton of financing the Russian opposition. By 2008, the movement had started to turn into a kind of conglomerate whose activities were directed at tackling issues that were far less significant than the Orange Revolution. One of these projects was “Piggy Versus,” which involved Nashi activists periodically raiding supermarkets in order to clear the shelves of items that had passed their sell-by date. Then there was the “Stop ‘em” project, which attempted to make sure that reckless drivers observed driving laws. At a youth forum in 2010, Nashi activists set up an installation that featured the decapitated heads of certain Russian opposition leaders and Western politicians on sticks. The heads were wearing caps with Nazi symbols on them. According to Vedemosti, projects like “Piggy Versus” and “Stop ‘em” will now be shut down and replaced by separate, non-commercial organizations. Nashi co-founder Vasily Yakemenko believes the movement needs a new direction now. “In 2005, fifty thousand people came out to support the Nashi movement rally against the Orange threat in Russia. On December 6, 2011, Nashi activists were the only ones who went to Mayakovsky Square in support of the election results. In 2012, there were twenty thousand activists left on the squares, ready to fight. Now everything is just repeating itself,” Yakemenko told Vedemosti. “The Nashi movement had two goals: it wanted to control the ‘street,’ and it wanted to make sure that today’s youth was cut off from the opposition,” political analyst Aleksei Makarkin told RBTH, adding that the organization had failed on both accounts. The authorities will continue to engage in youth politics, but efforts in this area will be more localized. The article is a combined report based on materials from Izvestia and Vedemosti.